Swedish summer – A summer to remember. The EVS experience of Natasa Lampitsi. Living in Sweden for two months seems to be a short period of time but for me, it was so intensive that it feels like I lived there for much longer. 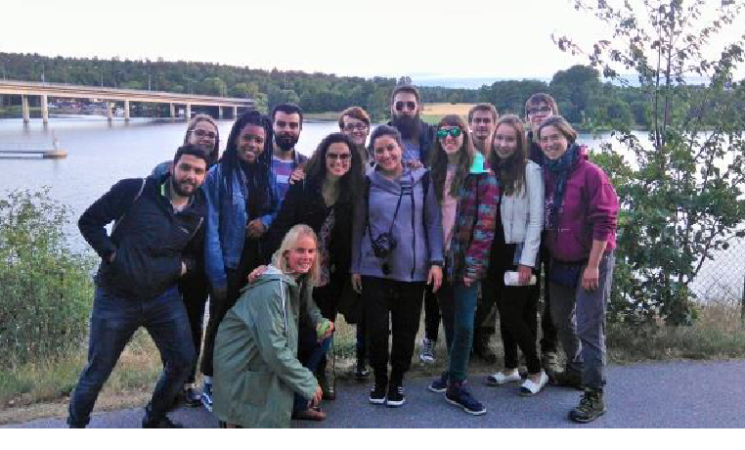 It gave me the possibility to explore Sweden as an insider, to experience the Swedish culture, the Swedish landscape, the Swedes themselves and their customs, to respect their mannerisms and to appreciate their positive features. Swedish people love nature and respect every little creature. They enjoy staying at home and they rarely leave the comfort of their country. They are calm and introvert and hate conflicts or disturbing others. They keep their personal space (if you travel by bus, you will notice!) and they are afraid to initiate interaction with others. However, if you ask for help, they are very eager (many of them) to help you. Almost everybody speaks English remarkably well! And they are intent on recycling EVERYTHING! I cannot resist but to initially refer to the Swedish nature. Its landscape is simply breathtaking that it’s impossible not to be taken in by! Wherever you look, there is a forest, a park, a lake… (90 000 all over Sweden!!!). It feels so natural walking in the woods, exploring nature, cycling in the countryside, enjoying the rainy days from the comfort of your home, appreciating (the few!) sunny days, sunbathing by a lake, listening to the music or reading a book at a park, relaxing and simply enjoying silence … I dare to say that it’s the place to get to know your inner self – at least in the summer. First things first… If you come from a country where summer means wearing shorts all day/night long (temperatures up to 35-40+ degrees), then you ‘suffer’ a temperature shock when you visit a northern country in which your winter is their summer! Nevertheless, I was lucky enough to experience (some!) sunny days with amazing weather. It was strange to see people swimming in a lake even when it was 20 degrees or less. But I definitely enjoyed it myself when it was 25 degrees! castle, situated by the Baltic Sea. I still remember how cold the water was when I dived in with my Bosnian friend Boba! During my stay in Sweden, there was never a dull moment. When I wasn’t busy planning and organizing activities for my hosting organization, I was travelling. I tried to visit as many places as possible, among them the Møn Island in Denmark and Copenhagen. It felt wonderful exploring the capital by bike with millions of bikers in its busy streets and stepping down to taste mouthwatering local beer. Sweden on the other hand, is such a big country and I only had the chance to see southern Sweden and a bit of the highly populated center. When in Stockholm for my EVS on-arrival training course, I strolled by the canals and enjoyed the view of this simply amazingly elegant venue, with naturally beautiful sights. I could ever ask for. interesting details of our EVS journey; our highlights and low points, our rights and responsibilities as volunteers, information regarding our projects and our NGOs, difficulties we encountered, thoughts and feelings. Not only did I make new contacts for potential partnerships but mainly, I made some new international friends with whom I felt connected with and had shared precious moments with, despite our differences. And of course, one cannot refer to Sweden without special reference to FIKA! It’s a Swedish style coffee break accompanied by something savoury like crackers and cheese or (usually) something sweet; cake, cookies, muffins, etc. Swedish people simply love Fika and would join you for Fika with pleasure, anytime, anyplace. In Sweden they love coffee and you can easily get good coffee wherever you are, at reasonable prices (if you consider how expensive everything is) and refill your cup as many times as you want! As far as my introduction to the Swedish language is concerned… jag har ont i huvudet! (= I have a headache!) Unfortunately, due to our busy schedule, I only attended four Swedish lessons during my EVS! And since almost everybody speaks English so well, I didn’t feel the need to push myself to learn more. Not to mention that in Växjö people speak their own dialect as in many different places in Sweden, which made it difficult for me to understand, even the basics. However, I learned a few expressions and I can now recognize Swedish among other languages! helpful when I visited their school. I enjoyed myself so much interacting with the pupils, listening to the children talking about Sweden and answering questions regarding Cyprus. I’m looking forward to collaborating with them, soon! As a former board member, but still a volunteer in my nongovernmental organization in Cyprus, I am engaged with activities that promote mutual understanding and respect among young people. 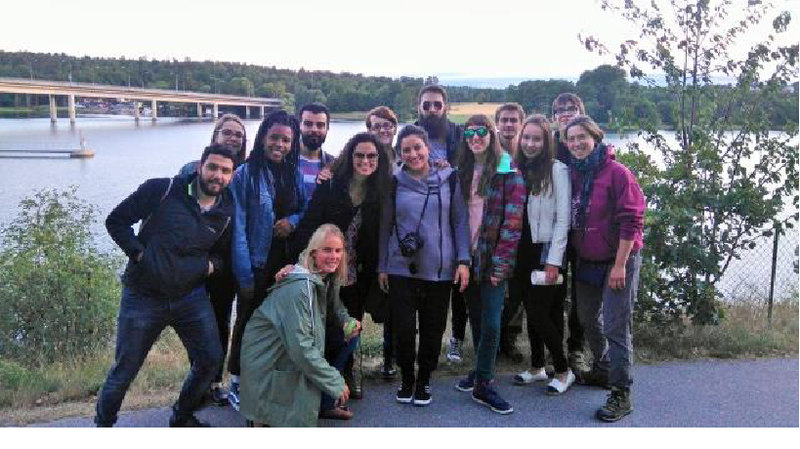 During my EVS not only did I better understand how a Swedish NGO works, but my eyes had also been opened in order to become even more inclusive and respectful to diversity. Leading participants gave me the chance to gain first-hand experience of the groups, to explore group dynamics and to further expand my skills in planning, organizing and developing workshops and activities accordingly. Our summer projects certainly demanded a lot of time, even long skype meetings weeks before my arrival in Sweden, but it was all worth it! role to play in easily breaking the ice among the participants, trying out new ideas, creating land-art and successfully merging outdoor activities with learning opportunities. While facilitating and actively participating in the activities (canoeing included), I enjoyed every single moment. It was such a valuable experience and I am very grateful to everyone I met. Each and every one made this experience unique. worthwhile despite the challenges. Besides: “If you want something you never had you have to do something you've never done”. The EVS journey was definitely one of the most interesting chapters in my life. Not everything was perfect but it was unquestionably worth it. It still takes time to re-adapt myself to reality, especially in our small, narrow-minded society but I’m remaining positive. I learned to appreciate what I have and I feel very lucky to have had this experience and to bring new ideas and new perspective in whatever I engage with. Special thanks to my NGO YEU Cyprus and my hosting organization Globala Kronoberg for making this real  Tack så mycket to all the supporters throughout this journey – they know who they are  Until the next one!